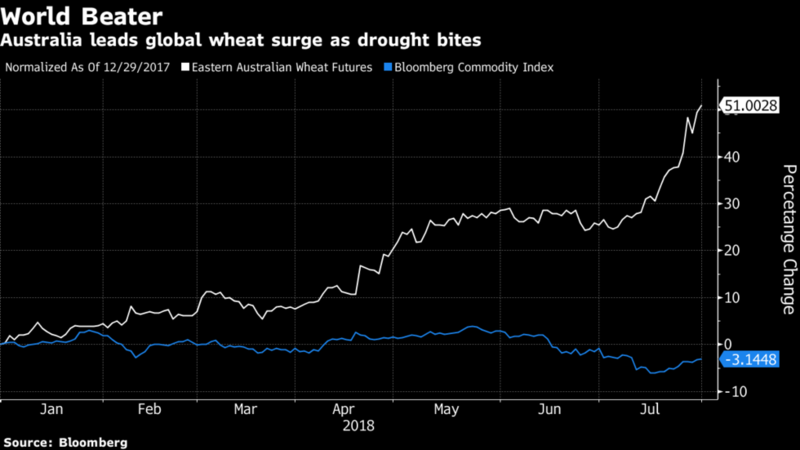 Last week, Financial Times writer Emiko Terazono reported that, “The wheat market is feeling the heat, with key global producers sweating over a drought that has curbed output. 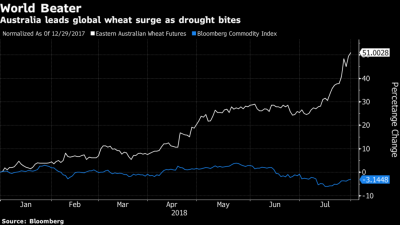 After several years of bumper harvests, the wheat market is poised to tighten sharply as Russia, Australia and EU countries contend with scorching temperatures. “Drought turns up the heat on wheat producers,” by Emiko Terazono. The Financial Times (July 30, 2018). 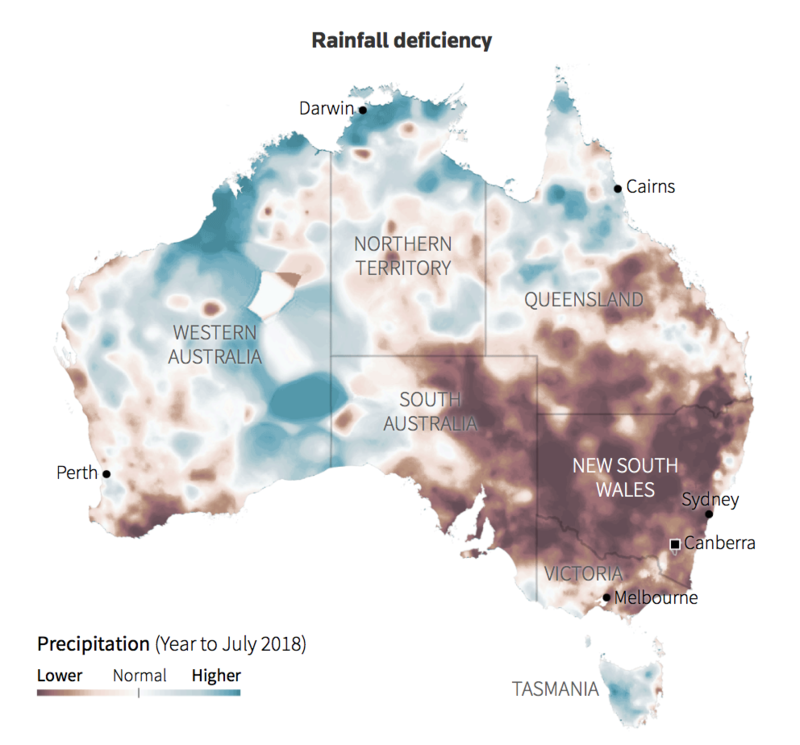 “In Australia, the state of New South Wales has announced a A$500m aid package for struggling farmers, while Germany’s farming association has called for €1bn in financial assistance from federal and state authorities. 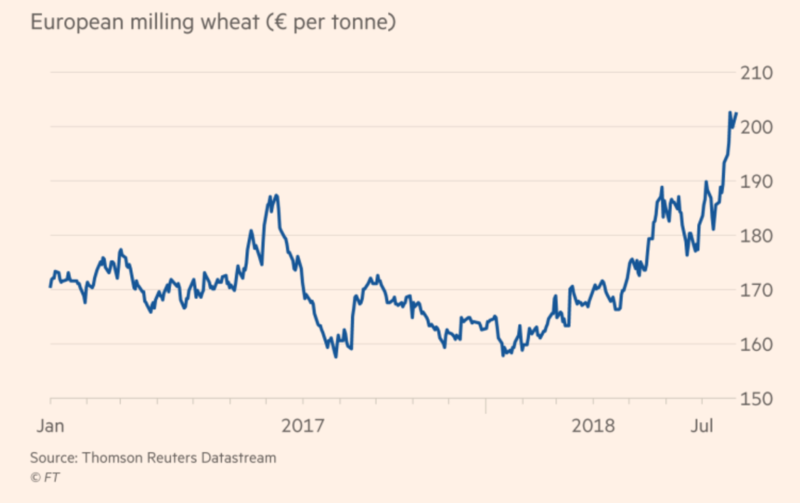 ‘After the huge surpluses of the last two to three years, we’re really facing a big change,’ said Gabriel Omnès, grain analyst at consultancy Strategie Grains. 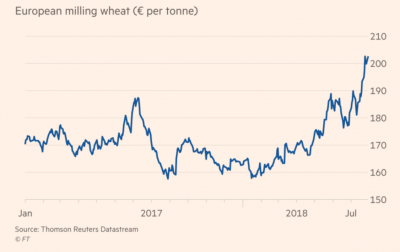 Led by a drop in major exporters, world #wheat stocks at the end of 2018/19 (aggregate of respective local marketing years) seen falling for the first time in six years, down 18m t y/y, but still the second largest on record, with nearly half is estimated to be in China. 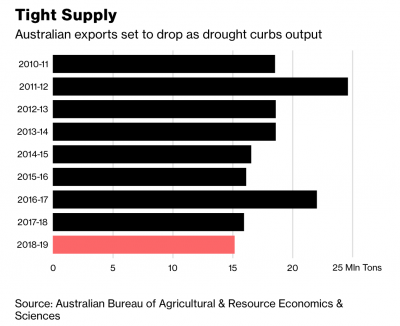 “Drought Sends Australian Wheat on a World-Beating Rally,” by Phoebe Sedgman and Alfred Cang. Bloomberg News (August 1, 2018). “The worsening production outlook also threatens to tighten exports,” the article said. 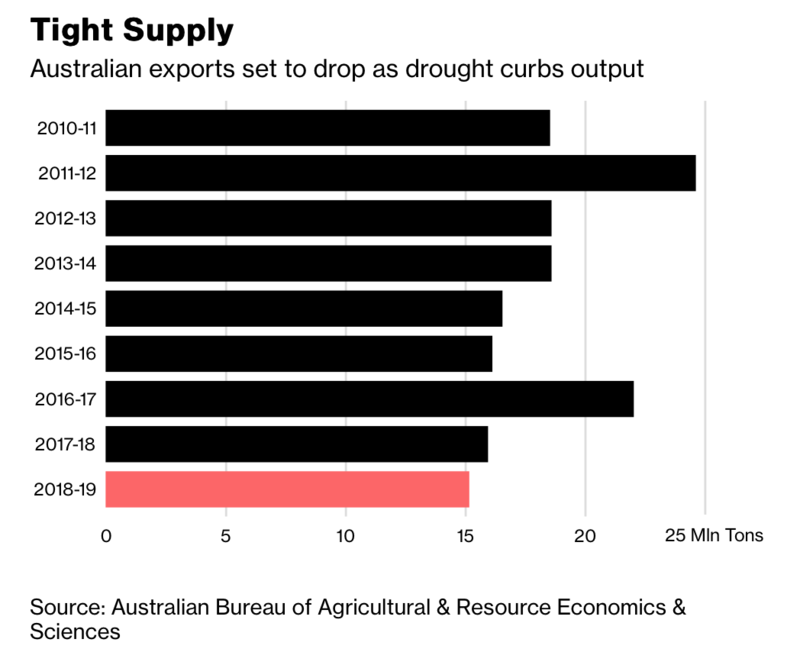 “Australia’s Drought: The cancer eating away at farms,” Reuters Graphics (August 3, 2018). “Short-range weather forecasts show no further showers for at least five days,” the article said. 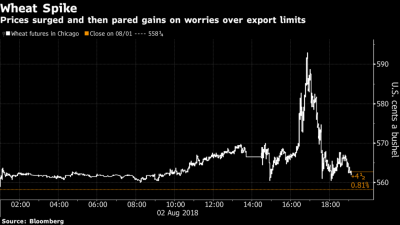 “Wheat Market Goes Haywire After Ukraine Signals Export Limits,” by Volodymyr Verbyany and Isis Almeida. Bloomberg News (August 2, 2018). 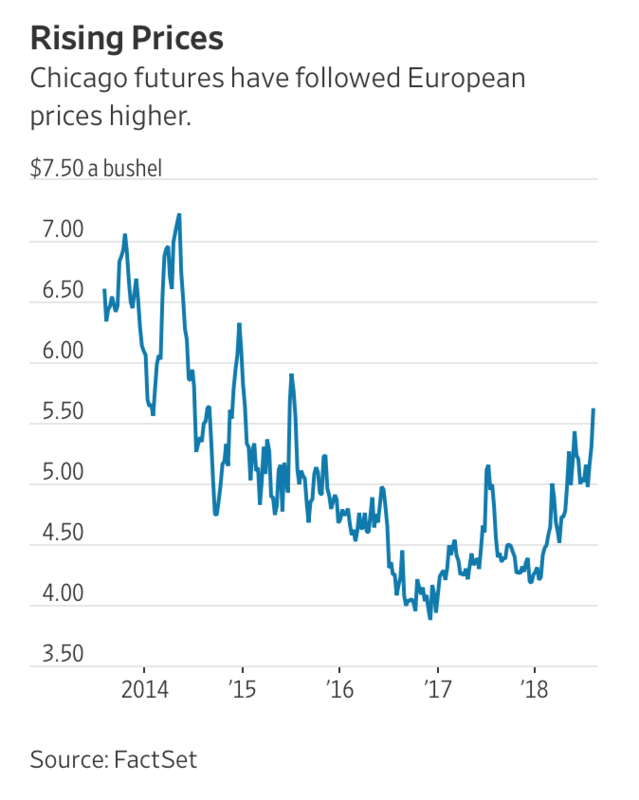 And Wall Street Journal writers David Hodari and Benjamin Parkin reported on Saturday that, “Global wheat prices have soared to multiyear highs as a heat wave sweeping across Europe and Asia slashes forecasts for this year’s harvest. 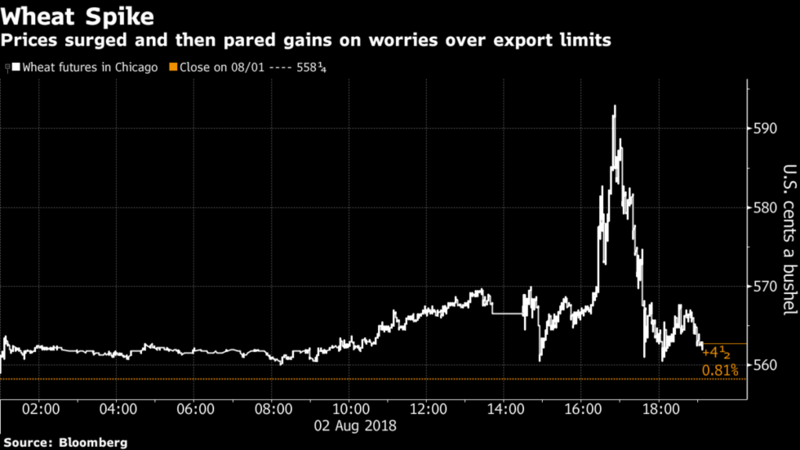 The price rise could potentially provide some relief to North American farmers, who have largely avoided such scorching weather, just as Chinese tariffs sap demand for other crops like soybeans. 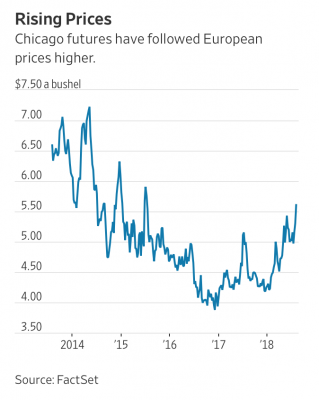 “Global Heat Wave Toasts Wheat and Prices Soar,” by David Hodari and Benjamin Parkin. The Wall Street Journal (August 4, 2018).